"Enriching Lives & Families Within Our Great Community"
Your complete guide to all available badges. We have partnered with Play Unplugged to bring a new program to the school-aged children in our community. If you, or someone you know, wants to become a sponsor, you can download the signup form below. If you have any questions, give us a call at 208.238.0088. Play Unplugged is all about encouraging kids to put down their electronics and get out and play. This is done by creating a symbiotic relationship between kids, parents, and the local community. This relationship creates an incentive for all to participate as one motivates the other. It all begins with motivation that works. The kind that get’s kids playing and active without them even knowing it. This motivation is based on a reward mechanism that excites kids. We call it a Brag Badge. Who Hands Out The Badges? This is where the local community comes in. 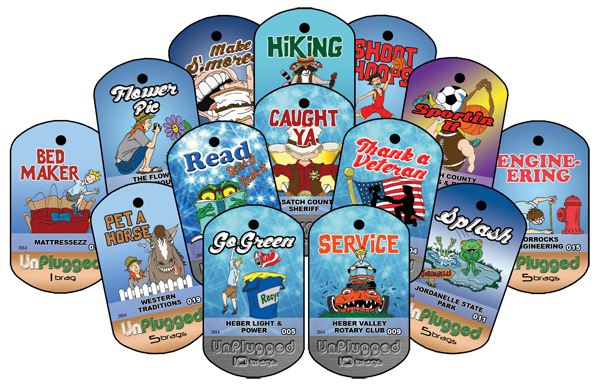 In order to engage the entire community, we encourage local businesses and/or organizations to sponsor an activity or Brag Badge. That way when a child is ready to collect a badge, they go to the sponsoring entity to pick it up. This leads to a substantial increase in visibility and foot traffic for participating sponsors. As kids engage in the Play Unplugged program, it helps solve the “I’m bored” epidemic that plagues almost every parent throughout the summer. As a result, this provides incentive for parents to encourage their kids to collect as many Brag Badges as possible. Local businesses are incentivized by the opportunity of meeting potential new clients therefore giving them the desire to participate in the program. This incentive cycle is repeated over and over all summer long. Kids are happy, parents are happy, the local community is happy. Best of all, the program sustains itself. Everyone wins! The Elf Project will continually strive to do good by enriching lives and families within our great community!